The fit of hysteria that gripped some people after the BJP (or is it just Narendra Modi? Can’t tell) swept the Lok Sabha polls, does not seem to ebb even after so many months. They continue in their delirium and have no use for rational discussion, do not listen to any counter-argument; they just cannot stand a single word of disagreement. Their hysteria keeps brimming over shrilly all the time. They cannot be dismissed as the occasional crackpots who one always finds in society, because of their sizeable number. Nor are they the kind of folks who equate loud noise with joy; who dance in abandon during public festivities. So, what is it that is bringing out the beast in them? This surely is a matter of concern. Twitter, Facebook, etc are known as ‘social media’. I think ‘virtual media’ is a better name to describe them. Here, you exist through your word and it is possible to hide your identity, if you so wish. As a result, people tend to be a little more relaxed; expression is much more extroverted. One would expect this to lead to a catharsis of one’s inhibitions and obsessions and consequently to a cleaner social interaction in the physical world. But no; social media has been used as a machination to entice the innocent and the gullible. It has also become a convenient forum for abusive expression of hatred. And that is not all. Being abusive on, say Facebook, does not result in the catharsis of the vicious emotive forces in the mind. On the contrary, it becomes an indulgence. There was a time when caste, religion, language, class used to determine the divisions in society. For the present day ‘netizens’, the criteria are ideas and itches. These mental activities bring some together and separate them from others. 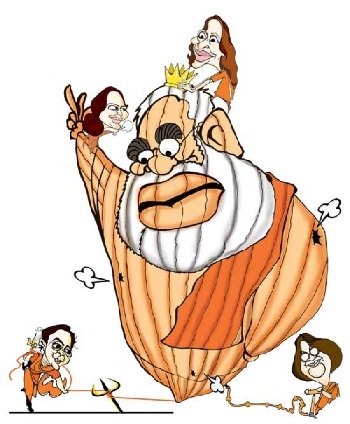 Among Modi devotees, there is a greater prevalence of hate-mongers who betray a tendency to attack as a mob, to constantly needle their opponents and they seem to enjoy the time spent in character assassination of their political rivals. Now I fully understand Mr. Karnik’s concern that social media should not become a platform to dish out abuses by one side against their opponents but should facilitate healthy debate. But Mr.Karnik should know by now that it takes two to tango. To know the depraved comments used against Modi and the BJP on a constant basis on the same social media, I recommend him to take a glimpse at the IndiaFacts feature, the daily Secular Tweet Digest. Thanks to the Internet, the special eminences who till now were carefully guarding the gates of the flow of information were in for a rude awakening. Now anyone with the will to know the truth as well as the reality of issues facing India whether they are social, historical or political can do so with a few clicks of the mouse. And Mr.Karnik, were you this agitated during the last decade when at every given moment the then CM of Gujarat Narendra Modi was abused and demonized by the liberal eminences in the media, academia and intelligentsia? It is another matter that every single verbal attack by the Congress party and its followers against Narendra Modi during the past decade only served to strengthen him. But that does not take away the fact that he was the only person in post-1947 India to face the status of a political pariah for a decade without even being given the chance to explain himself. In spite of proving his mettle as an able administrator, as well as proving his development credentials, Modi was derisively called ‘India’s Fuhrer’ by this same group. Also, did you forget Mr. Karnik when early last year, a significant section of students protested outside Delhi University’s Shri Ram College of Commerce ( SRCC) shouting slogans against the then Gujarat CM Narendra Modi, ignoring the fact that the SRCC alumni themselves wanted to listen to him? This was the same case when CM Modi was invited to address the members of the Bengal Chamber of Commerce and Industry in Kolkata. All these real-world hysterical protests were accompanied by abuses heaped on Modi supporters on social media as well. Even the women were not spared with Modi-haters labeling them as ‘Hindu Hags’ and ‘Modi Mausis.’ But it seems Mr. Karnik can only see one side of the coin. To be clear, this doesn’t mean that Modi supporters are justified in hurling expletives at their opponents. But what makes the Modi critics so suspicious of him is for them to answer. Ours is a country where I can stand up and fearlessly declare that “I do not believe in God, I will not treat Gita as a holy book, I shall not hesitate to eat beef if I am required to; I am a Hindu through and through.” Here a caste (and the quasi judiciary system of the caste) has an iron grip over the life of its members; but an individual also has the right to break away from those shackles. As a matter of fact, flexibility, diversity are the very reasons why this culture has managed to survive for centuries. If the Hindu in general falls prey to the hysteria, that will be the end of the ancient culture of this land. It is good to know Mr. Karnik cares about Indian culture, and therefore I ask him why not question the secular eminences who continue to peddle distortions about Indian civilization and culture with academics like Kancha Ilaiah even calling India a fascist state? Mr. Karnik would do well to get an idea about how Indian culture and its traditions and Gods are being vilified and demonised on a daily basis by Modi-abusers by reading these three exposés. Both India and Pakistan got their freedom at the same time. We have constructed dams, built steel mills, manufactured aeroplanes and tanks, created autonomous prestigious educational institutions like the IITs, have had a focused and fruitful atomic energy program. Our planners adopted the principle that the poor in the country will have the first right over the scarce natural resources. All this happened without having to play second fiddle to any superpower of the day. The tsunami of the last decade had struck the south east coast of India too. But by then, India was no more a poor country at the mercy of the rich and the powerful. The Manmohan Singh government politely declined to accept help offered by the West. It was in its second-term when the Manmohan Singh Government was accused of a policy paralysis. What about the earlier period? Was it not Rajeev Gandhi who took the telephone network to every corner of the country and who introduced us to computers? Was it not Indira Gandhi who nationalised major private banks and took banking to the Indian hinterland? Did she not help carve out Bangladesh, and thereby deal a body blow to Pakistan? Was it not solely on account of the astute adherence to the universally revered principles of non-violence and peaceful non-cooperation championed by Gandhi that Nehru managed to accord a respected place to our poor country, in the international arena? So, how can you go and say, ‘during the dark 60 years of Congress misrule’? It is ridiculous to say that the Gandhi-Nehru family did nothing but rob the country. To be blunt, Mr. Karnik has lost his sense of history. It is of course an undeniable fact that democracy in India has ensured that our nation does not get oppressed by the brutal system of Martial law unlike Pakistan but let’s face it: the record of India’s democracy is not all that clean. Nehru was wrong in almost all his decisions – whether it was the creation of a socialist state, his policies on Tibet and Kashmir, or tolerance for minority communalism. Perhaps the most damaging of Indira Gandhi’s economic legacies was the severe tightening of labour laws carried out in the “Emergency year” of 1976 through the insertion of the restrictive chapter V(B) in the Industrial Disputes Act. In effect, this made it almost impossible for an industrial enterprise with more than 300 employees to either retrench its workforce or even close down without government permission, which was rarely given. The law was tightened further by lowering the threshold level of employees to 100 in 1982. The provisions essentially turned labour from a variable factor of production into a fixed one! The massive discouragement to fresh employment ensured that India’s organised sector employment (including nine million government administrative employees) stagnated at less than 30 million out of a total labour force of around 500 million. In 2010 organised manufacturing accounted for less than 1.5 per cent of the nation’s workforce!… By negating India’s comparative advantage in labour-intensive manufacturing, these laws helped ensure that India’s manufacturing sector stagnated at around 15-16 per cent of GDP, compared to over 30 per cent in China. Labour laws and SSI reservation policy were important factors explaining the absence of a large and growing class of factory workers in India, in strong contrast to East Asian nations where this category formed the core of a rising middle class. I hope that Mr. Karnik is well aware that the dark days of Emergency, the rise of militancy in Punjab, Bengal and Assam, as well as blatant rowdy acts of the Youth Congress led by Sanjay Gandhi are all part and parcel of Indira Gandhi’s legacy. ….. Rajiv Gandhi’s model did not succeed, whereas the Vajpayee government’s policies curtailed the state’s role and created space for private entrepreneurs to deliver cheap and reliable telecom service speedily on a massive scale. The former tried to grow by state-led indigenization, the latter threw open the sector to competition and entrepreneurship..
Also, Mr. Karnik, for a quick, byte-sized information about Rajiv Gandhi’s “achievements,” head here. It is definitely undeniable that the Nehru-Gandhi family gave us some instances of pride but most of those instances came at the expense of heavy losses, under which we are still reeling. And the forces unleashed by the Gandhi-Nehru family have done more to make India flaccid, and a still struggling economy. So Mr. Karnik please get your history right. A sense of history alone will explain why Narendra Modi is regarded as a saviour by millions of Indians. As for abusive tweets, how about these gems?